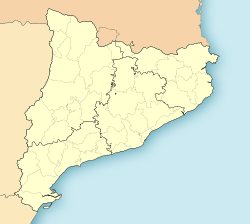 Ponts is a municipality an toun in the comarca o the Noguera in the province o Lleida, Catalonie, Spain. It is situatit on the left bank o the Segre river near its confluence wi the Llobregós river an at the point whaur the routes frae Calaf (currently the C-1412 road) an Cervera (currently the L-313 road) meet the route frae Lleida tae La Seu d'Urgell (currently the C-1313 road). Economy is based on agricultur (cereals, olives, vine, potato, sunflouers) an ainimal husbandry (domestic sheep, pigs, birds). The industry sector comprises fuid processin an textiles. Sant Pere de Ponts, a Romanesque kirk built in the 11t hunderyear. Auld quairter o Ponts. Wi the teepical portico o the Major Street. Rialb reservoir]]. This is the biggest dam in Catalonie. Segarra-Garrigues Canal. It is the name o a important watter line that supplees pairt o Lleida. Parc La Roca del Call. It is a ootdoor multi-sports complex, especially canoein an kayakin. Circuit del Bosquet (kent as Circuit de Ponts an aw). It is ane o the best motocross circuits in Catalonie. Boncompte Museum. It is a private collection o fireairms. Wikimedia Commons haes media relatit tae Ponts (Noguera). This page wis last eeditit on 11 Mairch 2018, at 13:28.